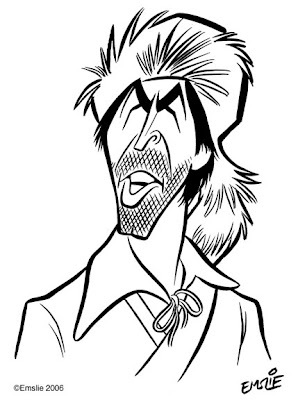 Sadly, early today we lost Fess Parker, the actor who brought the character of Davy Crockett to life for Walt Disney. The role originated on Disney's Sunday night show and became a huge overnight hit, leading to Fess Parker becoming a major cult hero to the generation of kids who first watched the made-for-TV movie that was shown in 3 weekly installments. 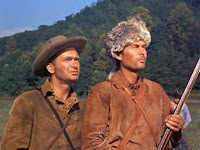 The film also led to an unexpected demand for spin-off merchandise, including the famous coonskin cap that made Disney's Davy Crockett such an iconic pop culture figure of the 1950s. Fess only made a handful of movies for Disney after that, and a few films along the way for other studios, before he decided to pretty much retire from acting in the 1970s and devote all of his time and effort to operating his own vineyard and winery in California. Standing 6' 6'', Fess Parker was a gentle giant of a man, soft spoken and amiable to all who met him. I'm glad to know that he lived a long and happy life, passing away peacefully today at age 85. I know he has left behind a legion of longtime fans who will always remember him fondly. In fact, I'm going to dedicate this post to my good friend and former colleague in the Walt Disney world Art Department, Jim Story, one of Davy's biggest fans! 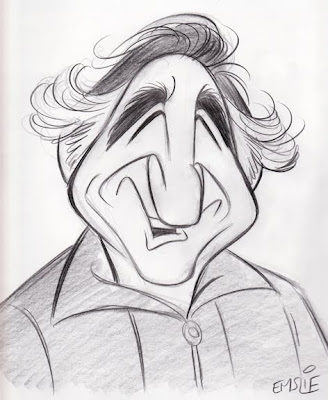 I haven't had time to take this to a more finished version, so here is a pencil sketch of Judd Hirsch, perhaps most famous for his role in TV's Taxi. This was primarily drawn for the ISCA (formerly NCN), the International Society of Caricature Artists, for the ongoing daily celebrity birthday forum, where all the members can draw their version of a celebrity who is chosen for each day. Admittedly, I had a tougher time drawing Judd than I reckoned I would. He's got a face that's ripe for caricature, but I wasn't able to find as much good video reference as I like to work from, so I had to use a combo of online video clips and a few good photos, all courtesy of Google, the artist's best friend! Were David Niven still with us today, he'd be celebrating his 100th birthday! This debonair actor has long been one of my favourites, perhaps because I've always had a soft spot for the Brits, due to my own British parentage. I think he was also one of a handful of actors whom I was familiar with at a fairly early age. Although I would have been too young to have seen him in 1963's The Pink Panther when it first premiered on the big screen, it seems that movie was one of my favourite comedies once it started turning up regularly on TV just a few years later. 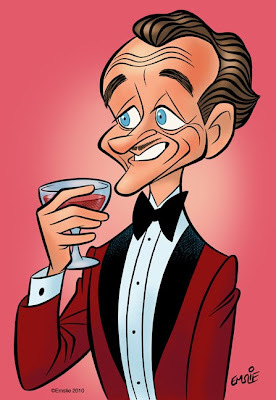 It was from viewing this film again that I have created this caricature of David Niven. In The Pink Panther, David Niven was cast as Charles Lytton, who is also secretly "The Phantom", a notorious jewel thief who has his sights set on the "Pink Panther" diamond owned by Princess Dala, played by beautiful Claudia Cardinale. Totally unaware of Lytton being "The Phantom" is the klutzy Inspector Clouseau, brilliantly brought to life by Peter Sellers. This is a film I can watch over and over again, not only for the rich comedy and sophisticated cast, but also that wonderful music score by Henry Mancini. Interestingly, though David Niven was meant to be the main star of The Pink Panther, he was upstaged by Peter Sellers in what was his first major Hollywood film role. Still, Niven holds his own and is a very engaging character throughout. He also famously portrayed the extremely punctual Phileas Fogg in the all-star movie adaptation of Around the World in 80 Days, from 1956. Just recently, I caught a showing of The Guns From Navarone on TCM, which is another one of his best films. I hadn't seen it in years and had forgotten just how good it is. Tragically, David Niven was diagnosed with Lou Gehrig's Disease, which left him severely debilitated in his last few years before he passed away in 1983 at the age of 73. In tribute on his 100th birthday, let's all raise a glass to this charismatic gentleman of the movies!